Scarecrows are a mainstay of Foundation design, originally created to protect the wide-open swathes of agricultural assets on newly terraformed worlds, but since reimagined into a deadly military asset. Here, we take a look at the scarecrow kit, and some of the various ways that you can hack it up and get all creative on its shiny, robot posterior. 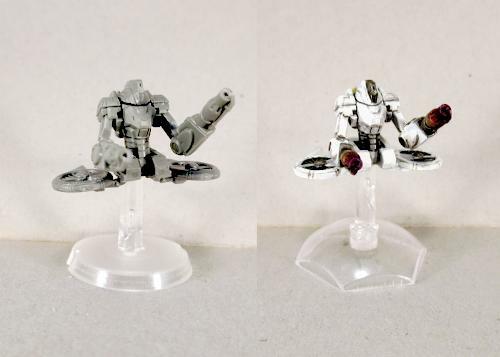 The Scarecrow sprue builds the regular Scarecrow, and also includes a variant head and command unit for the model's back to upgrade to the Scarecrow command variant, which lets you take an entire army of assorted Epirian robots. This kit was designed specifically to allow as much poseability as possible, with joints at the elbows, knees and ankles. The maglock railrifle that makes up the Scarecrow's long-range firepower is designed to sit horizontally on the top of the shoulder pad. 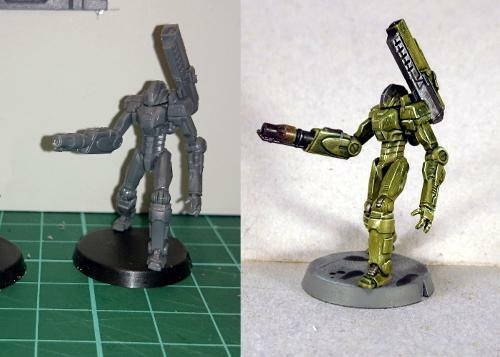 Thanks to the flat planes of the shoulder pad, however, it's easy to raise the railrifle up into a 'standby' position by simply gluing it onto the back of the pad instead of the top. 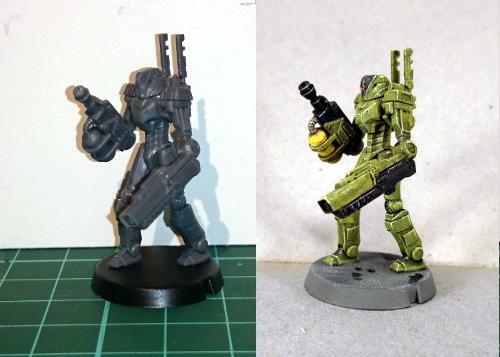 Alternatively, you can substitute the railrifle for the left forearm by cutting the elbow joint off the forearm and gluing it onto the back end of the railrifle. 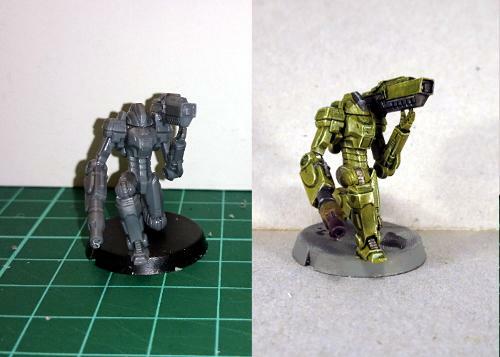 For a slightly more complicated variant, the below model has the railrifle substituted in for the right arm weapon. The right shoulder was trimmed up slightly to allow the shoulder pad to swing around a little further than normal, the right elbow bent in slightly, and the left wrist sliced through and the hand rotated to support the rifle. 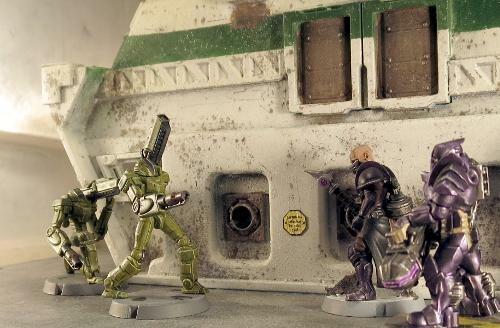 The chemtech sprayer is on standby on the robot's back, where I would assume some handy mechanism allows him to swap out the two weapons as required. 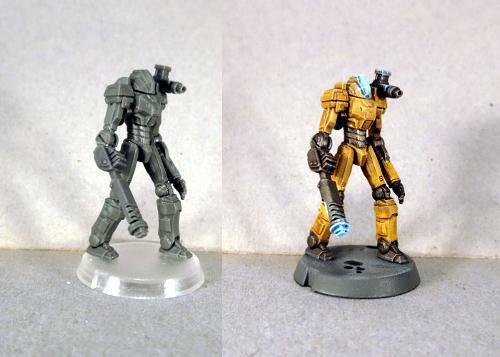 A variant of the Scarecrow bot swaps out the railrifle in favour of two linked clingfire sprayers. 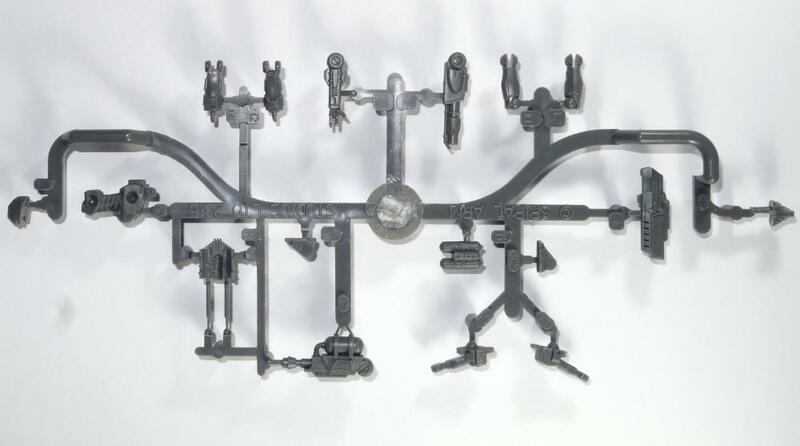 Each sprue only comes with one of each weapon, so you'll need to steal the second from another Scarecrow sprue, but the weapons are designed to fit onto either arm. This variant is also useable as a Subjugator bot, an assault mech used by Epirian Suppression squads. While there's no particular need to do anything to make a Subjugator visually different to a regular Scarecrow, why let that stop you? The below model (which I'm calling a 'tiki-bot') is a stock standard Scarecrow with the command unit trimmed up a little and glued over the face. 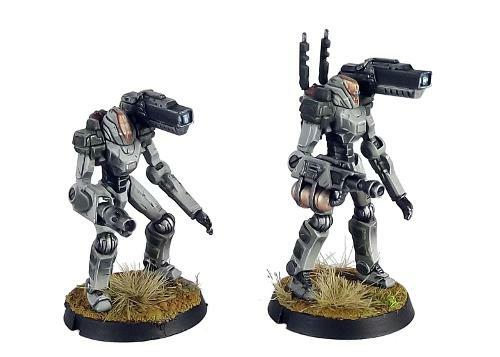 If you prefer your crowd control to be more mobile, you can remove the legs entirely and replace them with a handy flight unit, made from scavenged turbines from a Firefly drone (which you'll have left over if you went with Spider drones instead). 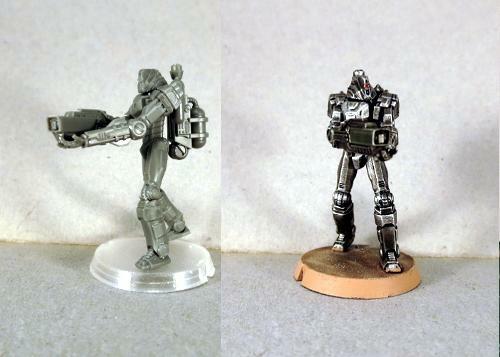 For a slightly less out-of-the-box option, you can use a grenade launcher from the Bot Handler sprue and a force rod from the Faction Expansion sprue to make a closer-quarters version of the Subjugator. 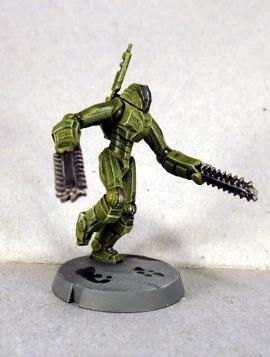 And finally, the up-close-and-personal variant, made by swapping out the arms for legs taken from a second kit (this gives the shoulders a slightly wider range of movement) and adding some chainsaw blades taken from a Games Workshop Space Marine kit. There are no rules for these last two options - I just thought they would be fun to build. I'd love to see what people come up with for them, though! 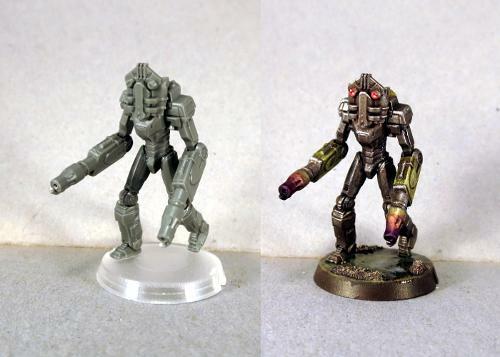 If you're feeling the urge to create some killer robots of your own, you can pick up the Scarecrow in a pack of two from the Maelstrom's Edge webstore here. And as always, feel free to share your creations on the Comm Guild Facebook page! Cool! Always enjoy these posts.